Leostar Plus is one step above Leostar Standard as it contains one extra module of your choice which can be chosen from the list of optional modules given on this page. So from this package not only you shall get all the benefits of Leostar Standard but also one extra module of your choice that caters to your needs/meets your requirements. Leostar Plus contains all features of Leostar Standard and the features of optional module chosen by you shall add extra colors and features to your software thus converting it into Leostar Plus. Vedic Astrology Software Leostar Plus contains all feaures of Leostar Standard i.e. 1) Inclusion of all important divisional charts. 2) facility of horoscope matching on the basis of ashtakoota guna matching and manglik dosh compatibility. 3) Objective of Astrology is to give accurate predictions about future but its utility lies in prescribing the correct remedies and this astro software gives remedial measures like lucky gem, navgrah Mantras and articles for donation. 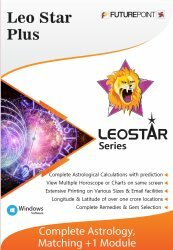 4) All types of astrology tables required by astrologers are incorporated in Leostar. 5) Shadbal, Dashaphal, Jaimini, Transit, Longevity, Databank of horoscopes, yogas, astrograph, kaalsarp dosha, sadesati vichar, 30 year prediction, manglik vichar and remedies which are not only useful for an astrologer but also a layman. 5) In addition to the above mentioned features the inclusion of any optional module of choice out of the following given module makes it Leostar Plus- These modules out of which any one of choice has to be picked up are - Varshaphal, KP, Horary, LalKitab, Numerology, Muhurat, Mundane & Panchang. Varshphal, KP, Horary, Lal Kitab, Numerology, Muhurat, Mundane, Panchang. The additional features of Leostar Plus would vary on the basis of the module of choice picked up. Avakhada, Ghatchakra, Tara Chakra, Panchang, Calendar and Kundli Milan. The modules that one gets in Leostar Plus software are Teva, Matching, Astrology, Tables and one module of your choice. Detailed matching calculations & predictions. Details of bride and Groom, Degrees of Planets & Dasha. Ashtakoot Guna Matching table, summary, and detailed report. Manglik Dosh Matching with conclusion. Horoscope Matching compatibility according to Traditional, Gujarati and North Indian style. All Astrology Charts and Dashas. Both the horoscopes can be studied and analysed independently also. Extra features in matching are analysis of health, nature children, wealth and relations with in laws. Different types of Aynanshas used in astrology like Lahiri, Kp, Raman, Jaimini, Bhrigu, Manu and Sayan are available in it. All horoscopes can be saved in it. This vedic astrology software contains longitudes and latitudes of 1 Crore cities. User can get additional information like astrograph, longevity, kaalsarp dosha, sadesati vichar, manglik vichar and remedies etc. too from this astro software.